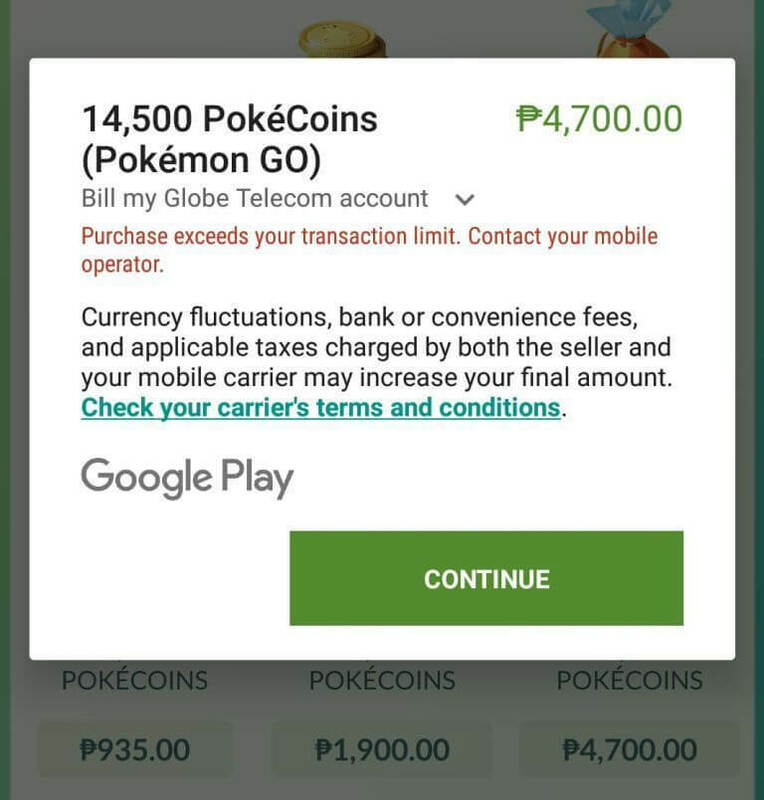 As Pokemon Go is already available in Philippines both major telcos (Smart and Globe) announced that gamers can now purchase or buy Pokecoins. You can now upgrades anytime by visiting the shop using their prepaid and postpaid account. Pokécoins are use to purchase Pokeballs, Incense, Lucky Eggs, Lure Modules, Egg Incubator, Bag upgrade and Storage upgrade. Items available in Pokémon Go shop are already converted to peso (PHP) currency. When you buy Pokemon items on shop using Smart and Globe prepaid you must reload your mobile account with the amount required to purchase a particular item. You can also charge to bill if you’re a postpaid plan subscriber on both networks. Tap Pokeball icon, then go to Shop to see the list of items available for purchase. After you tap the item (Pokecoins), you are prompted by Google Play billing option. If you’re Smart subscriber you can see "Bill my Smart Communications account" and if you’re Globe you can see "Bill my Globe Telecom account" on payment methods. Just tap BUY button to proceed with the purchase then it will prompt you to input your Gmail account for confirmation purpose then click CONFIRM to continue. You will be prompted with Payment successful if you have enough load or credits on your account. See also Smart and Talk N Text gives Free Internet Access using Pokemon Go. This is just one of the options you can use to buy Pokecoins on Pokemon Go if you don’t have credit card available. You can still use credit cards to purchase items on shop, just follow the same steps above then change the payment option to add credit or debit card to do an online transactions. For now this payment option is available to Globe and Smart, they haven't announce yet if it is available to TM (Touch Mobile), TNT (Talk N Text) and Sun Cellular. If in case you happen to purchase Pokemon items using other networks aside from Globe and Smart just hit the comment box below to share your experience. Ba't saakin USD parin hindi Peso? pano po pag usd at hindi converted to peso? tapos ios pa?? Baka po kulang pa yung load niyo. Kasi po may tax po na dinadagdag kapag bibili via load. kaka purchase ko lang po. nag successful naman pero bakit ganon? d ko agad nakuha pokemon go coins ko? Same problem. P51 load ko pero ayaw ma-purchase nung 100 pokecoins which is P47. May 12% vat. Pag mag pupurchase ng coins. Anyway. Sino naka try na TM subscriber na nakapag purchase ng coins? 52.00 pesos iyung price po. Bakit sa akin USD padin, then di ako makabili napupunta sa billing address pero wala option kung saan i charge. May additional tax po kasi yung para sa purchase. magpasobra kayo para maka avail kayo. Successful purchase sa smart prepaid pero walang pokecoins na dumating?? cno nakaencounter na nito?? I am a postpaid subscriber and I can't buy coins "not enough credits left in your account" post paid nga eh. I don't need to buy load. Buti pa kayo kahit prepaid nakakabili kayo. Mas weird akin.